Classic co-op game Doom is coming to the iPhone next week, though the version is actually based on the Doom III game. Titled Doom: Resurrection, the game is rebuilt from Doom III assets and code - no small feat. Sadly the game is going to miss a core feature that's been a staple of all Doom games, co-op. Carmack said the game has features that could be unlocked later with the release of iPhone 3.0 software. That includes peer-to-peer cooperative multiplayer, where gamers can connect with each other and play in the same multiplayer game, said Tom Mustaine, managing director of Escalation Studios. So it's good news that a simple software upgrade could provide the features most of us so desperately crave. 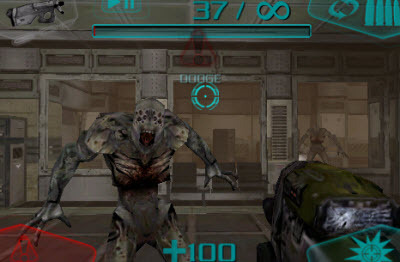 Above and beyond that, the iPhone version of Doom is said to run at a solid 30 FPS on the latest iPod Touch. In fact, according to Carmack, the iPod/iPhone lineup has the potential to display better graphics than the PSP or NintendoDS. The game has eight full levels and about five hours of game play. The team expects to be able to use various iPhone software 3.0 features once they are released, but Carmack said the game was built to run fine on the current iPhone operating system. The game runs at 30 frames per second on the latest iPod Touch, and perhaps half that speed on the earliest iPhone handsets. There's no price listed, but you can expect the game to fall in line with normal App Store pricing.